Authorized Distributor of Greenlee Textron Products > Radar Inc.
Greenlee is the premier source for professional grade tools when it comes to installing wire and cable. They have a comprehensive line of electrical tools including EMT, PVC, and rigid conduit benders, fishing and cable pulling products, cable bending, stripping, and crimping tools, power cable cutters, as well as electrical testers, temparature testers, clamp meters, and multimeters. 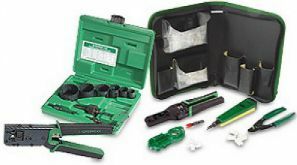 They also have a complete line of hand tools such as pliers, saws, screwdrivers, insulated drivers, tool bags and accessories, as well as a complete line of storage boxes.